American River College celebrated two women who have devoted their professional lives to public service during college hour on Thursday. Former legislative analyst and state assembly staff member Pamela Haynes and former state senator Deborah Ortiz were the women honored . “These women are not only empowering and devoted to their public service work, but they are a part of our history here at ARC,” Leonhardt said. Haynes has served on the Los Rios Community College board of trustees since 1999, and Ortiz since 2010. Both women have served as president of the board, and Ortiz currently holds that title. This particular college hour’s premise was to acknowledge and celebrate these women during Women’s History Month. 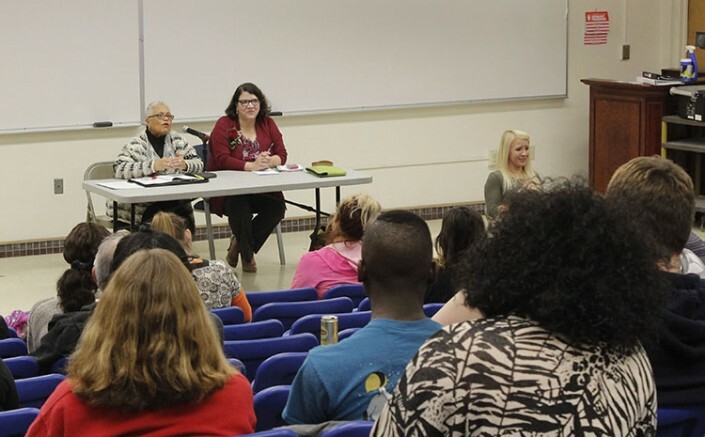 ARC’s Center for Teaching and Learning wanted to acknowledge their hard work and dedication, and the college hour gave the women the opportunity to talk about their backgrounds and their work. Haynes and Ortiz also answered questions from the audience. Most questions were regarding how these women got to where they are today, and what factors led to them becoming elected officials in such a predominantly male career field. Haynes credits her long lasting career to her commitment and her allegiance to her work. “If you’re a hard worker, it will go a very very long way,” Haynes said. Both Haynes and Ortiz advocated for more women and minorities to enter into public service work. ARC hosts college hour weekly, every Thursday from 12:15 p.m. to 1:15 p.m. in Raef Hall 160. Be the first to comment on "ARC hosts Women’s History Month college hour"